We are dedicated to bringing accurate, specific information about home inspectors and home inspector training to anyone in Washington DC who needs a home inspection or is interested in becoming a home inspector. 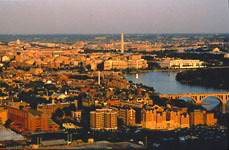 Currently, there is not a licensing requirement specific to home inspectors in Washington DC. However, we do recommend using a home inspector who has a nationally recognized certification in home inspection. Certification to become a home inspector is, depending on the training school used, a quite rigorous process. A well-informed and well-trained home inspector is a necessity when buying a home, underwriting a loan, or possibly even when selling a home. Becoming a licensed home inspector isn't easy, but it shouldn't be. It's one of the reasons home inspectors are well-paid. If you're interested in viewing the training requirements of becoming one, click here to view the Professional Home Inspection Institute's training course outline. More information about DC Home Inspection is available from the Become a Home Inspector in Washington DC link.